The Chicago based trio, Femme de Champagne are a seasoned assortment of musicians who explore pop songs with French sensibilities while weaving together rock, jazz, and folk styles to bring you a refreshing aperitif of entertainment. Babette Novak is the front woman and ultimate ring-leader of Femme de Champagne. She has traveled across the globe gathering knowledge and musical influences to form the eclectic mix of music that Femme de Champagne radiate. Their sound includes cabaret pop and liberal doses of power pop tossed around. The trio consists of Babette Novak (vocals, keyboards, guitars), Mike Collins (drums), and Fran Kondorf (bass). 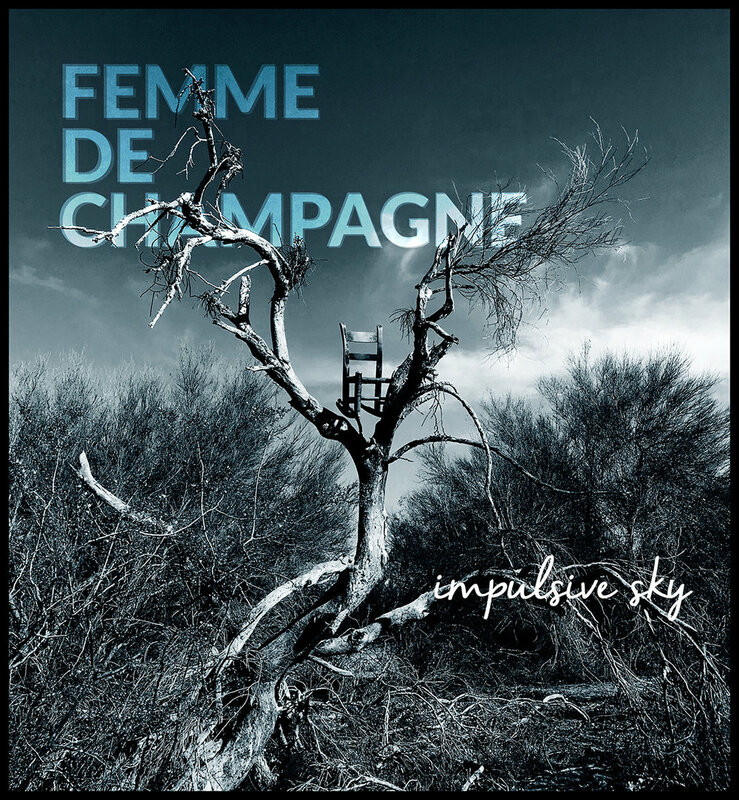 Femme de Champagne will be releasing their album, Impulsive Sky nationally on Friday, December 7, 2018. Impulsive Sky was recorded and produced at Kingsize Sound Labs in Chicago. Mike Hagler was at the helm of the studio engineering and producing the album. “Mike is an awe-inspiring producer! He knows that I have my own ideas about how and what to record for each song, but he isn’t shy about offering ideas for changes.” Mike suggested adding the B3 organ you hear in ‘Sun Kiss.” Originally, the song was a three-instrument song. For Femme de Champagne, Mike adds a little more polished sparkle to each tune. Impulsive Sky was written over the past 5 years. It weaves a tapestry of stories and vignettes exploring love, loss, independence, and a celebration of human resilience. Femme de Champagne pushes boundaries to create a unique sound that honors the past while creating a new future. The album artwork for Impulsive Sky was captured by photographer Stu Jenks. Babette saw the photo posted on one of Stu's websites and was able to procure it for the CD cover. The artwork conveys some of the moods illustrated on this album. Babette has released a few records, since she was a young, fledgling songwriter. Her very first song was called, “Ruler of the Ring” inspired by her love for The Lord of the Rings trilogy she had read. Music to Babette “is a medium that endlessly fascinates and engages me.” She is always writing songs and playing music. Babette writes songs that fluctuate from personal relationships to social commentary to emotional expression, whether being utterly joyful or feeling completely devastated, or just being at peace. She hopes that her music help audiences feel emotionally satiated and rhythmically keyed up. Babette hopes people connect to some of the lyrical content, for example, the stories involved. Babette is from a very musical family and started dabbling into piano, taking lessons at the age of 11. Her grandmother was an opera singer at the Lyric Opera in Chicago. Her grandfather used to be a piano tuner and even owned his own line of pianos before the great depression. The music of Femme de Champagne is heavily influenced by the French language and lifestyle. This influence stems from Babette’s love for traveling. She has traveled all over Europe, but loves France the most. She can speak French to a degree, which explains the band name, song titles and lyrics. She only drinks proper champagne from Champagne, France. Babette has influences outside of her immediate family and travels. Anyone who is resolute in the face of suffering inspires Babette. People who are able to climb to the top without hurting everyone below them motivate her. David Bowie is a massive musical influence for Babette. Others include Diamanda Galas, Polly Harvey, Robyn Hitchcock, Varèse, Shostakovich, Bjork, Nick Cave, David Byrne, The Beatles, Parliament, and Small Faces. Femme de Champagne, eclectic pop trio from Chicago, will be releasing Impulsive Sky nationally on Friday, December 7, 2018.